Please forgive the literary theft of Charles Dickens words, but they seem to apply so well to the present situation in the Donner Summit Valley. In an amazing turn of events over the last two years, the preservation of the Summit Valley has been transformed into “restoration” of a valley that may never have existed. 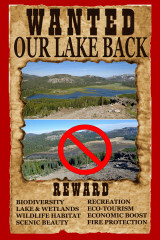 In a rather self-fulfilling manner, Truckee Donner Land Trust (TDLT) has created a rationale that will completely transform the Valley destroying a unique combination of open water lake and rare alpine marshland habitats in the name of an alleged scientific restoration. It is all based on a clever little ploy that takes advantage of the current asymmetric distribution of water in the valley. Figure 1. 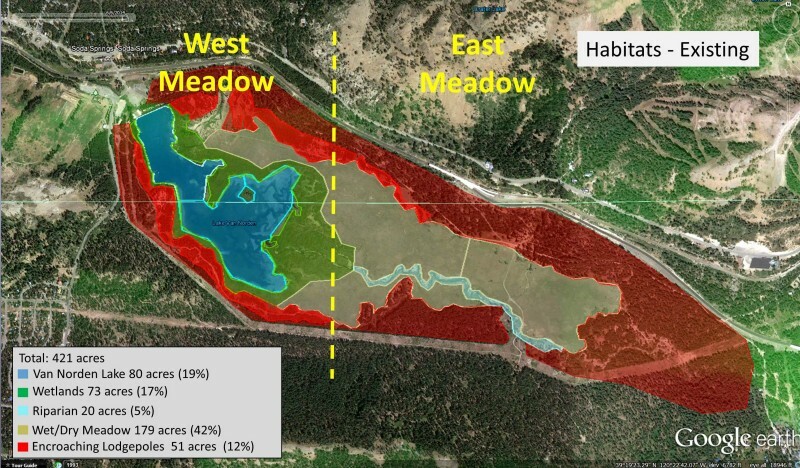 Currently the habitats in the Donner Summit valley are configured asymmetrically with lake and marshlands at the western end and seasonal wet/dry meadow at the eastern end. and the remaining eastern portion of the valley is seasonal wet/dry meadow. It is easy to separate the valley into two “meadows” based on this asymmetric distribution of water and their associated habitats, one at the west end and one at the east. It is also easy to see how TDLT has chosen to concentrate on only one of those meadows at the expense of the other. Figure 2. 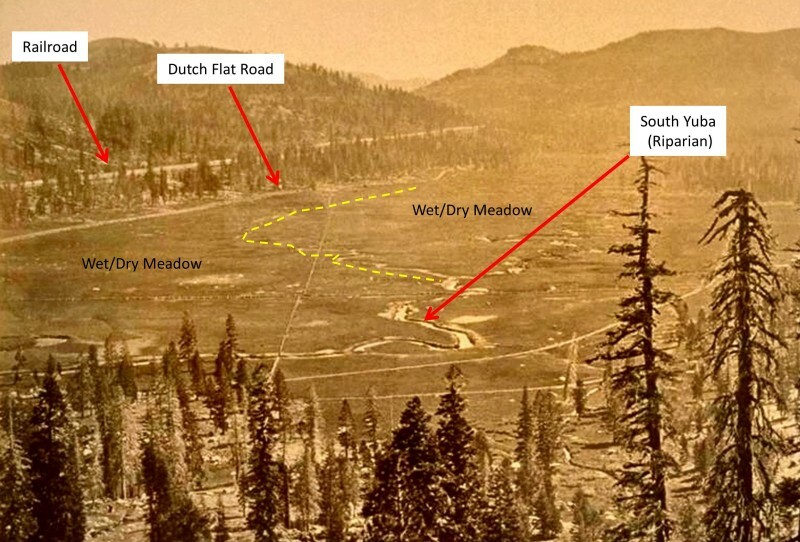 Photo of Donner Summit Valley circa 1870 that shows the valley before construction of a dam and the meadow as seasonal wet/dry meadow. It is true that the current dam is out of compliance with the state and impounds water without the proper rights. This is indeed an issue that has to be worked out with the state of California. It is also true that the dam and the water it impounds have serendipitously created the rare and biodiverse lake and wetland habitat in the west end of the valley. When TDLT acquired the Summit Valley property they made their intentions clear that they would work to preserve the Valley including the lake. As it became clear that this would require considerable effort and could complicate their plan to transfer the land to the USFS, they chose the more expedient solution of draining the lake and wetland habitat. In order to rationalize this reversal, TDLT came up with a strategy that completely ignores the destruction of the lake and wetland habitat and concentrates on the seasonal wet/dry meadow portion of the Valley. It is this intentional distortion that allows TDLT to make the claims of scientific and environmental improvements of their restoration plan. When you put your blinders on and choose to only consider the seasonal wet/dry meadow habitat in the Summit Valley then all the arguments that you hear from TDLT make sense. Who wouldn’t like to see them re-establish drainage systems and increase the water distribution to raise the water table of the east end of the meadow. Of course doing those things will improve the habitat and the biodiversity of the wet/dry meadow. That is why TDLT can claim that they have the support of scientists and hydrologists. In fact, it makes perfect sense if you realize that bringing more water into the east end of the valley will make it more like what currently exists at the west end of the valley. And that’s the rub, they are only telling the truth for half of the valley. What TDLT is not saying is that while their plan will increase the water and make the east end of the meadow more like the west end, they will be destroying the west end and making it much drier by removing hundreds of acre-ft of water and significantly lowering the water table. While they may make the east end wetter for a longer period during the summer, the unique open lake and wetlands at the west end will be destroyed and the overall water level in the entire valley will be significantly decreased. Pond and plug restoration does require the help of invasive species. You will hear from TDLT and others about things like water course modification and pond and plug methodology. These methods have been proven to work to increase water retention in mountain meadows and would probably significantly increase water retention at the east end of Summit Valley. However, the reality is that these methods are not by any means “natural”. All of these methodologies require heavy excavation to create the infrastructure to support them. Moreover, because they are not really natural processes (show me a Sierra meadow in which plugs and ponds occur naturally), they require continuous maintenance and repair. You will hear that these methods “reconnect” the drainage with the floodplain. That sounds like a good thing and it probably is. However, it is not the “natural process”. In fact, river and stream formation by erosional down cutting is the natural process. The South Yuba River flowed through Summit Valley long before any settler came through the valley. This begs the question of what is the Summit Valley going to be restored to. The assumption implicit in the word restoration is that you are returning something to a previous state. Plug and pond restoration is really a reset of the water drainage with the original floodplain. It has been thousands of years since the South Yuba river was connected with its floodplain. The reality is that meadow restoration of the east end of the valley will improve its health and vitality, but its restoration will by no means be “natural”. The feasibility and sustainability of the restoration state, whatever it is, will be uncertain. 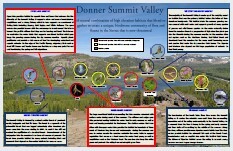 It has always been our intention to work towards preserving the rare and unique blend of habitats that have been created in the Donner Summit Valley. We applaud any efforts toward improving those habitats, including many of the proposals by TDLT for the east end of the valley. However, unlike TDLT, we cannot justify the improvement of some of the habitat such as the wet/dry meadow at the expense of destroying existing lake and marshland habitats. 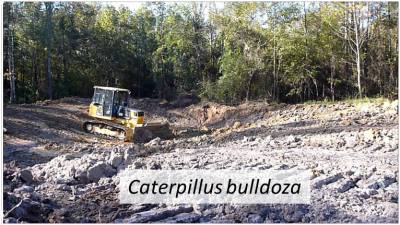 Retaining more water in the wet/dry meadow may improve that habitat, but removing the lake and wetland habitat will also remove all of the species that depend on that habitat. I was really shocked when I spoke with a biologist from Point Blue that told me it was OK to lose the lake habitat in the Valley to increase the wet/meadow habitat because that was more valuable in some way. This sort of statement can only have been made in ignorance of just how special the lake and marshlands are. Lake Van Norden is a unique lake in the Sierras because unlike the scooped out glacial tarn lakes that predominate in the area, Van Norden is a shallow lake that spreads across the floodplain and provides unique habitat for many species of flora and fauna. That flora and fauna will cease to inhabit the Summit Valley if the lake is removed. In my mind any decrease in biodiversity within the valley is just biologically unacceptable. We think that the best solution for the Summit Valley is a comprehensive one that combines preservation of the valuable lake and wetland habitats with restoration of the wet/dry meadow to provide an overall healthy and diverse valley. I was shocked at how combative TDLT representatives were to long time Donner Summit residents voicing a love of Lake Van Norden. Why are they so disinterested in trying to work with people who know the history of the lake and don’t want to lose this valuable resource? Isn’t it the purpose of a land trust to purchase natural habitats to prevent them from development? Isn’t that why so many Donner Summit residents voted with their wallets to raise money to buy the land?